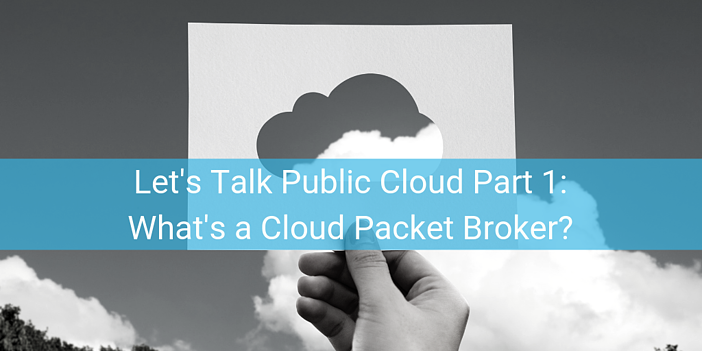 Let’s Talk Public Cloud Part 1: What’s A Cloud Packet Broker? tl;dr: Stop “flying blind” in public cloud platforms. Adopt and deploy next-gen cloud packet brokers in your cloud network. Get access and visibility into cloud network traffic to secure mission-critical workloads on AWS, Azure and Google Cloud. Welcome to our new series of blog posts called, “Let’s Talk Public Cloud.” In this and future installments, we’ll define cloud elements in 300 words or less. Let’s get started with our first post on cloud packet brokers. First, you probably know what network packet brokers (NPBs) are all about, right? These are the devices that sit between your infrastructure and tools layer. You plug your tools into the NPB so you can easily deploy and manage your security, probes, network performance management, and other tools used in the network. NPBs are hardware appliances required to ensure guaranteed network performance. To get the same performance in the public cloud, cloud-native solutions must be adopted and deployed. Enter cloud packet brokers – the next-gen NPB. Cloud packet brokers (CPBs) are born-in-the-cloud and designed to acquire and distribute cloud packet traffic. The CPB sends packet data to the tools – the network performance and monitoring tools used in the data center, but now in use to monitor your cloud platform. In cloud platforms, you no longer have access to the physical components of your network. In effect, you’re running blind in a dynamic environment of limitless size and scope. You can’t point to the physical internet cables, or access and manipulate the server that stores your data. Security in the cloud is all about creating the visibility you need to function as you’re have in the data center. Cloud packet brokers deliver the ability and visibility.